The swamplands that belongs to the monster, Killer Croc. A pace where some dinosuars here & there roam about. But one particular area was very important area is the home of Killer Croc himself, a cave. But someone is about to arrive. A sort of an unwanted guest. But this guest was a woman, a villanous woman to be infact! She looks on with a smirk as she wanders around the area & approaches the cave, wondering if the Croc is home. Arriving after days of travel from Doomstadt, Croc and his trio of dinosaurs have arrived back home. Mauler, Croc's newest pet Dryptosaurus, is greeted by Bindi who is a female Liliensternus. Curious to the new arriving theropod, both are sort of cautious, but they tolerate each other. Croc watches this while Genghis Khan wanders off with Agro to hunt for prey. The woman veentures thoughout the swamps that surrounded Croc's cave. She had a predatory dinosaur with her. Almost as if it was her personal pet. Soon, she reaches te edge of the forest & sees the cave, as well as Killer Croc himself. For she had heard of the attack he layed upon Doomstadt, Latveria. With a grin, she turns to her dinosaur with a wink & prpared to approach! Croc still watched as Mauler and Bindi began to runoff, perhaps play chasing despite the fact that they are adult theropods. Croc then walks over to a nearby rock cluster and sits down beside them. He is used to the outdoors more than any other being, so this is comfortable to his for most of the time. The woman looks on at Croc & his dinosaurs. She turns to hers with a nod & soon, the 2 walk toward Croc slowlly. Croc is about to fall asleep, but he then notices a random woman and an unknown dinosaur beside her. He isn't happy and reacts quickly to the possible threat. He gets up on his feet and says "This is my home, the one place I can have peace of mind…and you have ruined it”! “Who are you, human female”? "Oh I am so sorry, my good...man." the woman says as she & her dinosaur, with was a female Dilophosaurus made by INGEN & was genetically altered to spit venom. The woman comes to a stop as she stood there with her foot on a rock. She was wearing a rather attrective outfit, pink skin tight pants with bats on them & a putple skin tight shirt & a pink sleeve0like thing with a ring finer on it. The most distinguished feature was 2 sets of "wings." One pair on her head & another on her back. She was the 2nd leader of the woman gang called, "The Hellfire Club." "Allow me to introduce myself. 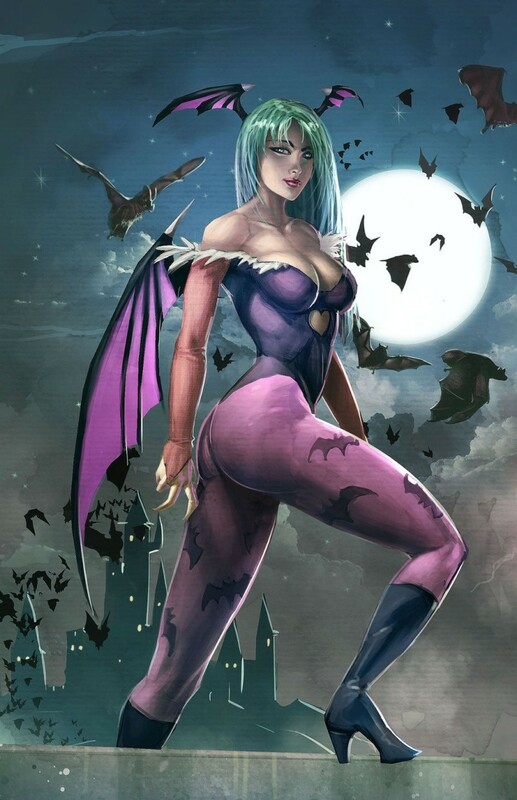 My name is- Morrigan Aensland." Croc is slightly baffled by the strange woman named Morrigan Aensland. However, he is still very angry at the intrusion of this human female. "Why are you here and give me a good reason as to why I shouldn't rip you apart" asks Croc with his fists clenched. "Why, I am here to explore the wonders of Killer Croc, wich is you. Now, I'm a part of a famous gang of bad gals like myself called 'TheHellfire Club.' I'm the secondary leader of the group. However, Ive been seperated from the group for quite some time for resons that you wouldn't understand, yet." Morrigan says as her Dilophosaurus stood by her, "& oh yes, I have my little bodyguard with me. Felica, my Dilophosaurus." she says again. Croc isn't as smart as most, but he really can't grasp what this woman wants. He laughs and says "Is this a joke human". "No human, especially a woman, has ever wanted anything to do with Croc but to see me dead". "Oh this isn't no joke, my scaly friend. I've read about you before. Read you spent most of your life in solitude & alone. I know what that's like....cause I've spent 4 years living by myself in caves from age 14-18 & I've been use to it." Morrigan says. Croc is utterly baffled by Morrigan's apparent interest in him, despite the fact that he is a reptilian humanoid and multiple murderer. "So...you want me to believe that a woman like yourself wants to get to know me" says Croc. Croc then thinks to himself for a minute before he turns and says "If your playing me for a fool, then I will not take such an insult without severe punishment". "One could say that." Morrigan says to Croc as she hears his next statement & held her hands up in defense, "Woah, woah, now big fella! I'm not trying to insult you in any way. You could say I come in peace." she says. Croc then turns his eyes back and looks at Morrigan. "So" says Croc turning around to look at her. "What is it you want to do, Morrigan of the Hellfire Club" he asks her. "Well, I could ask you for....a tour if you will?" Morrigan asks Croc as she wanted to know all the info of the place, wich could help her & the gang. Croc looks at Morrigan with suspicion, but is also curious about her asking for a tour, desptie Croc being a major threat to her well-being among other things. "Alright...I will give you a tour" says Croc. "But betray my trust at your own peril, female". He then turns around, ready to show off the area to Morrigan. O.O "Sheesh, can't you at least show the lady some respect, first. It's a bit rude to talk to ladies like that." >X) Morrigan says to Croc. Croc turns and looks at Morrigan with his yellowish green eyes. But as he does this, they are visited by the rarest dinosaur in Croc's collection, Nomad the Appalachiosaurus. A fairly large predator, Nomad sometimes stays back while Croc and Agro usually go off on quests, but he does come along every so often. He isn't particularly aggressive when compared to Agro and Genghis Khan, but the sight of the new dinosaur and woman catches his attention as he approaches behind Croc. Morrigan saw the Appalachiasaur following her & Croc. But she does nothing but follows. Feleicia stays by Morrigan as she follows her, keeping herself between her master & the other dinosaur that was following them. Nomad gets even more curious and cuts off Morrigan and Feleicia from Croc. Croc turns around and looks on as Nomad looks at Morrigan's face. He starts sniffing her, his snout pushing against her left cheek and pushing slightly. He then sniffs the other side of her face. O.O Morrigan looked on as Nomad begins sniffing her & pushes her slightlly. She has her hand up to try to push his nose away, knowing she likes a little space when walking. Nomad doesn't move off, but he does stop sniffing Morrigan and just at her for a few seconds. Then, a rare event happens...Nomad suddenly rubs his head gently against Morrigan. Croc looks on, surprised by this and says "He seems to like you, I have never seen him act like this before". "Hmmm, I could imagine. Ok, boy that's enough. I need my personal space when walking." =/ Morrigan says as she still tries to push Normad away, but it doesn't work, "Oh what's the use?" -.- she says as she finally gives up as she lets the dinosaur nuzzle her, petting his head. "Something is different about you, Morrigan" says Croc as he walks up to Nomad and pets his back. "You personality is strange to me...you seem like you adore me for who I am despite what I have done in my life". Croc thinks for a moment before he asks a question that he has never asked a woman before "Are you...attracted to me"?